When you're on a regular old cycle, you tend to miss out on the benefits of bring connected. 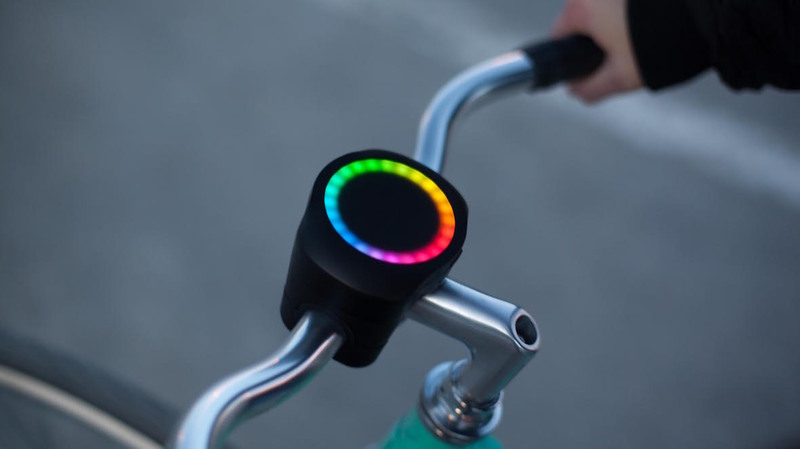 SmartHalo wants to fix that with its new digital handlebar assistant, a little squarish device that sports a circular display that contains a ring of colored lights. These lights can shine up and shine down to tell you a few different things. The first one is turn-by-turn navigation, with the lights pointing toward a direction. For instance, if you need to turn right in 400 meters all the lights on the right turn white. They'll gradually shade in green until it's time to turn right. The second feature is fitness. You can set your own fitness goals - distance, calories, elevation - and the circular array of lights will track them for you. When the ring closes, your goal is complete. The company says the device will both track and analyze your fitness metrics, and it'll do it all on its own, so there's no need to tell it when you're starting and when you're stopping. And finally, there's an assistant that'll let you know with a blue blinking dot that you've got call and text messages. It's also got an alarm. The SmartHalo uses sensors to detect when someone is jostling around your bike, perhaps trying to break it out of a lock. Once it senses that, it'll blare an alarm and shine some red lights. There's even a light on the front that automatically turns on when the sun sets and automatically shuts down when you're done riding. SmartHalo actually started as a Kickstarter project that ended up selling and delivering 10,000 units. Now that it has all of those squared away, it's ready for the general public. You'll be able to purchase the SmartHalo starting today for $149.99 on the company's website.